Some of the other lovely TAY-ers have been sharing some of their collections, or stories about memorabilia they’ve acquired from years of gaming. I figured it’s high time I do the same. I don’t have many nerd things. OK, I have a shelf shaped like the Batman’s famous symbol. But that’s about it! Oh, and several of those awesome feudal Japan-inspired Star Wars action figures. But really, not a whole lot more. Well OBVIOUSLY I nabbed that Totaku thing when I heard about it, but just the Hunter figure. So really, just like a normal amount of things. Well, there are a few more objects that I collect. Smaller, perhaps nerdier things. I love me some enamel pins, y’all. The more the better. I sort of inadvertently began collecting them when I was a kid (my “outstanding student” pins from grade school are still proudly displayed on my backpack that I carry everywhere) and even into adulthood. My first real job was at Starbucks, and you can get all kinds of pins there. Your manager can give you a “mug award” (basically a “hey, you’re doing a great job!” from the higher ups) that amounts to a pin you can put on your apron or hat or what have you. Even Nintendo Power (RIP) occasionally included things like pins as subscriber bonuses. I even had a great Pikachu pin that I received in a Nintendo Power magazine that a coworker borrowed and never gave back. What I’m trying to say is: I had a good amount of pins just fall into my lap for no reason. Simply by existing (and apparently being an alright student and an average employee at an enormous multinational corporation) I had several pins gifted to me. Once I started more earnestly pursuing nerd things, I found out that there’s basically something for everyone. You like clothes with nerd stuff on them? You can find it! Like action figures? Figma, please. Trading cards? There’s probably some kind of card game based on your favorite property. And of course, there are pins. I’m personally a huge fan of the Penny Arcade pins. I love the special sets they’ve been doing lately- the SMB3 blind boxes are amazing and incredibly addictive (though I definitely used Ebay to hand pick a couple of the ones I really wanted, Tanooki and Frog Mario in particular). The Limbo set is from iam8bit and the Donut County and Juno pins were from playing demos at PAX East. For me it was the best swag of all- a couple new things to tack onto a jacket or coat. Functionality will almost always trump aesthetics in my book. Rather than a shelf full of statues I’d rather have something I can use. Fun pins are a bridge between the two; I can wear them, and they’re a neat way to have a little self expression. I’ve never been someone who would cosplay. I don’t get excited for Halloween or costume parties. Wearing a shirt with an obscure video game reference or pinning a Goombah to my shirt is about as far as I’ll go. But it can be enough to spark a great conversation or a surprising interaction. I once wore the 8-bit Mario to work and got to know a woman who works for Annapurna Interactive, solely because she asked where I got the pin and we went from there. Majora’s Mask always gets a compliment and, once, an interesting conversation about Ocarina of Time. There’s one item on here that I’m planning to wear at my wedding: the cape feather tie clip. It’s something subtle but still me, a nice way to feel connected to one of my passions. One of these days I’d love to get a video game-themed tattoo, maybe an 8-bit Mario or a one-up mushroom or something. For now I’ve got my pins, and on my wedding day, my tie clip. I’ve got a number of other pins- some comic book stuff, a few from Disneyland. 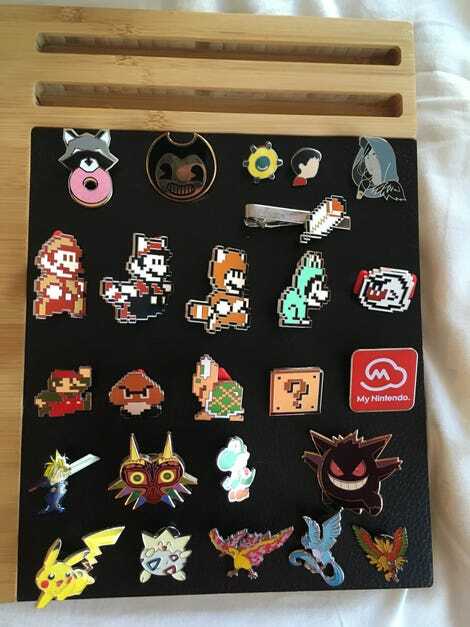 My video game pins are my favorite, though. I’m looking forward to filling out my collection more.